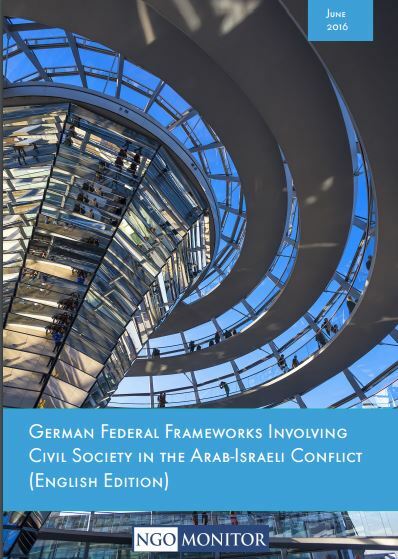 The German federal government provides millions of euros to political advocacy NGOs in Israel and the Palestinian Authority, through a variety of frameworks, including German federal funding programs of the Ministry for Economic Cooperation and Development (BMZ), the German Federal Foreign Office, government-funded church aid, and independent development NGOs. Officially, the funding is aimed at “combating poverty, securing food, establishing peace, freedom, democracy and human rights, shaping globalisation in a socially equitable manner, and preserving the environment and natural resources.” In contrast to these stated moral objectives, research reveals that German federal funding is allocated to, amongst others, organizations that promote anti-Israel BDS (boycott, divestment and sanctions) and “lawfare” campaigns, anti-Zionism, promotion of a “one-state” vision, antisemitism, and violence. Click for a compilation of articles highlighting NGO Monitor’s contributions to the broader conversation about NGOs, funding, and accountability in Germany. These include blogs and op-eds written by NGO Monitor and staff, as well as articles citing NGO Monitor, or otherwise relevant to our mission. German federal funding frameworks are severely lacking in terms of transparency and public scrutiny. Selection processes, precise amounts, project evaluations, and sometimes partner organizations are not made publicly available. Precise amounts are only available for Israeli NGOs, which are required by law to report to the Israeli Registrar of Non-Profits. According to reports submitted by Israeli NGOs, in 2012-2015 alone, €4 million of German taxpayer money was allocated to 15 Israeli NGOs (this may be a partial amount, as not all Israel NGOs adhere to the submission requirements), 42% of which went to organizations that promote BDS and/or “one-state” visions. The BMZ program Civil Peace Service (ZFD) “sends experts to international partner organisations in order to prevent the outbreak of violence without military action and to strengthen the force of civil society.” The program is entirely funded by BMZ. Implementing German organization: Weltfriedensdienst (WFD); local partner organizations: Al-Haq, Yes Theater. In May 2017, Yes Theater hosted a play that “tells the story of Palestinian Ali Taha, who became a martyr in 1972 at the Lod airport following the hijacking of a Belgian Sabena plane that was supposed to take off in the direction of the Lod airport in Palestine, to liberate 100 Palestinian prisoners held in Israeli jails. The martyr Ali Taha carried out the attack together with three members of the ‘Black September’ organization, an attack that ended in his death and the death of his friend Abdel Raouf al-Atrash, and the arrest of Theresa Halsa and Rima Tannous who participated in the attack” (NGO Monitor translation). Implementing German organization: KURVE Wustrow; local partner organizations: Coalition of Women for Peace (CWP), Youth Against Settlements. According to the Israeli Registrar for Non-profits, CWP has received NIS 1.5 million for this project in 2013-2017. The project has been renewed for 2017-2019. 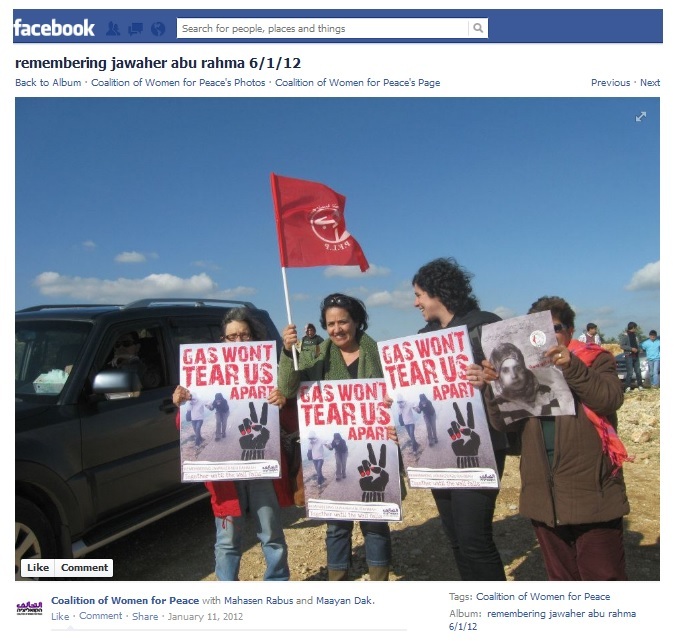 CWP officials have been photographed holding a flag of the PFLP terrorist organization. (Following a publication by NGO Monitor, this image was removed from CWP’s Facebook page.) CWP actively supports economic, cultural, and academic BDS campaigns against Israel. 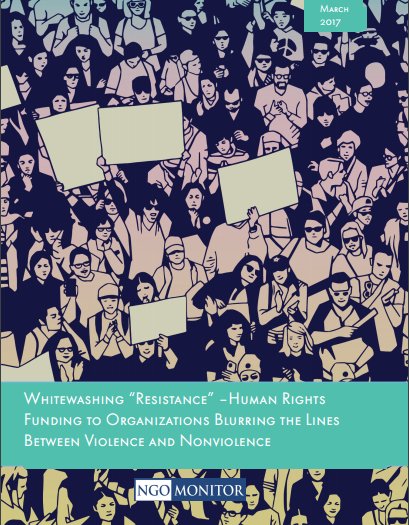 CWP claims “there are numerous discussions and debates as to the boundaries of non-violent resistance,” and asks “when is vandalizing property a legitimate part of a struggle and what property exactly… and of course, the ongoing discussion of the question whether throwing stones at an oppressing force is part of non-violent resistance?” (emphasis added). The GIZ leads several projects in the West Bank, many in partnership with local NGOs. These projects are commissioned and paid for by BMZ. Building Scenarios Towards – Socioeconomic Development in East Jerusalem (ongoing): Co-implemented by GIZ and Israeli NGO PASSIA. In a 2015 publication PASSIA describes a wave of terror that begain in October 2015 as a “youth uprising” and refers to Baha Eleyan as a “Palestinian martyr.” Eleyan was one of two murderers to board a bus in Jerusalem in October 2015 armed with a gun and a knife, killing three and injuring seven. PASSIA denies any historical Jewish connection to Temple Mount and its Western Wall, claiming that “Zionists could not present any documentary evidence of Jewish claims to the Wall” and listing “Placing signs at the gates of Al-Aqsa Mosque indicating that they are the gates of the ‘Temple’” under “provocations.” PASSIA is also funded by the German political foundation Friedrich Ebert Stiftung. “Empowering Women Leaders in Government and Civil society in the Middle East” (2015-2019): Local Palestinian partner organizations include Miftah, which publishes articles accusing Israel of “massacre,” “cultural genocide,” “war crimes,” and “apartheid.” In 2013 Miftah published an article repeating an antisemitic blood libel, claiming that Jews kidnapped and murdered the children of Christians to use their blood as part of a religious ritual during Jewish holidays. In a January 2017 interview for Deutsche Welle, founder and chair of the Miftah board of directors Hanan Ashrawi claimed that Palestinian “attacks and their perpetrators” (as described by the interviewer, Tim Sebastian), “are seen by the people as resistance. And you cannot somehow adopt the language of either the international community or the occupier by describing anybody who resists as terrorist (sic)” (3:20). Zivik is a funding framework within the Institute for Foreign Relations of the German Federal Foreign Office, meant to promote civil conflict resolution and “international peace projects in crisis regions and advises both non-governmental organisations (NGOs) and the German Federal Foreign Office." Zivik manifests an extreme lack of transparency. Information on its website is very limited, and vague when provided. However, at least three Israeli NGOs reported funding from Zivik in 2015-2017 (B’Tselem, Breaking the Silence, Ir Amim). Since 1962, BMZ is obligated under German law to provide financial support for the development work of church-aid organizations, with two church NGOs chosen as representatives – the Catholic Misereor and the Protestant Development Service (EED), today merged with Brot fuer die Welt (BfW). According to data from the Israeli Registrar of Non-Profits, 71% of total German funding to Israeli NGOs active in the Arab-Israeli conflict in 2012-2015 came from BfW/EED and Misereor. Zochrot (2012-2015: NIS 236,005): Campaigns for “right of return”; supports “one-state framework” and the elimination the Zionist State of Israel. Who Profits originated as a project of CWP “in response to the Palestinian Call for boycott, divestment, and sanction (BDS) on Israel”; it is now an independent daughter organization entirely dedicated to BDS efforts. German “politische Stiftungen” – political foundations affiliated with parliamentary parties – are funded by the Federal Ministry of the Interior, the Federal Foreign Office, and the BMZ in direct proportion to the seats held by the parties affiliated with them. Funds and partners with PASSIA (see above). FES co-implements a Young Leaders Program(YLP) with Palestinian NGO Women’s Affairs Technical Committee (WATC). Launched in 2015, “YLP Generation III” was held in September 2017. In May 2017, WATC inaugurated a youth center in the town of Burqa, near Nablus. The center is named after Dalal Mughrabi, a terrorist who in 1978 murdered 37 civilians, including 12 children. Upon learning that the center had been named after a terrorist, the Norwegian government and the United Nations, both of whom had funded the center, issued strong condemnations. 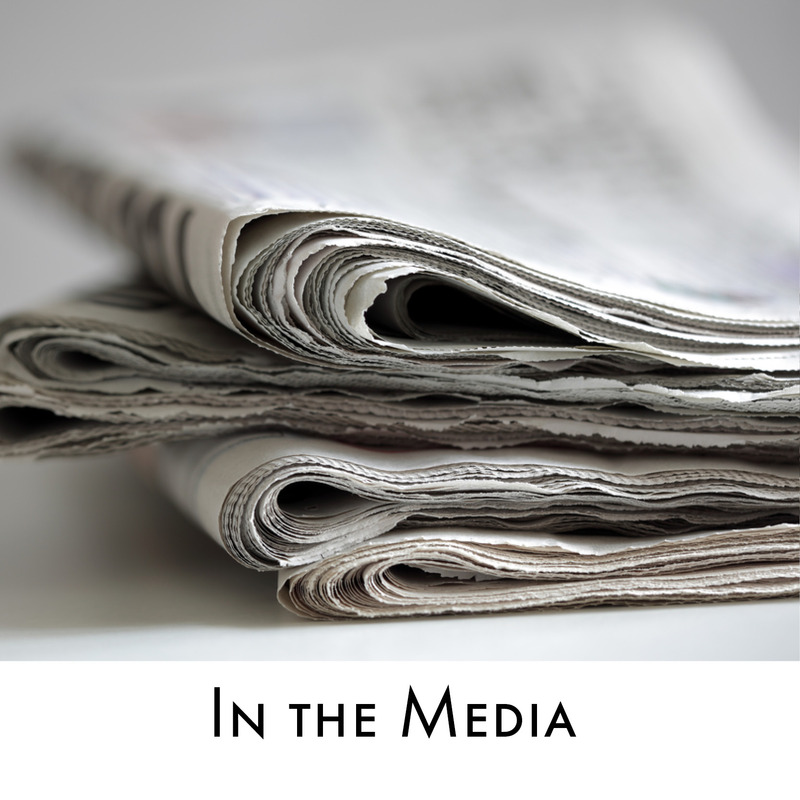 The Danish and Dutch governments have subsequently terminated their funding to WATC. In June 2017, PNGO condemned Norway for pulling funding from a youth center named after a terrorist (see above), referring to Mughrabi as a “Palestinian Woman Freedom Fighter,” and stating that “there is a difference between freedom fighters and terrorists” (emphasis added). NGO Monitor is an independent, non-governmental organization which provides information and analysis, promotes accountability, and supports discussion on the reports and activities of NGOs (non-governmental organizations) claiming to advance human rights and humanitarian agendas. NGO Monitor has no political affiliations in Germany or any other country. With regards to Alternative Fuer Deutschland, we wish to refer to the joint statement of our friends and partners in Germany, the Jewish Organizations in Germany from 3, September 2018. 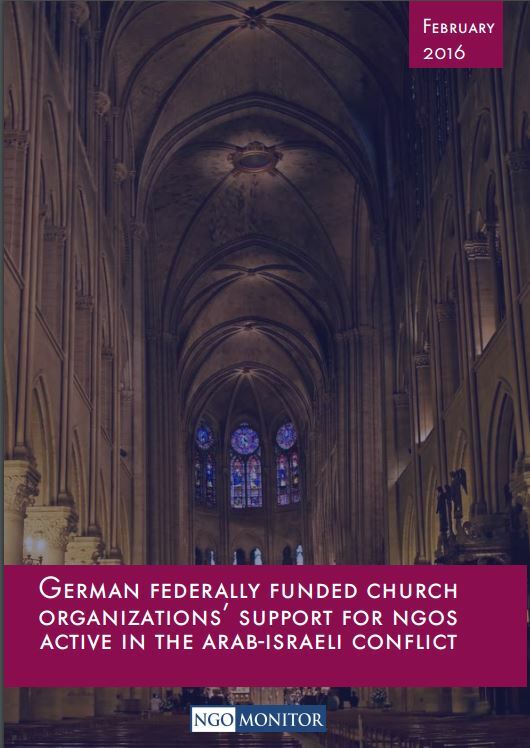 Church aid organizations in Germany, which receive most of their budgets from the government, are major funders of politicized NGOs in Israel and the PA.
German federal funding is allocated to, amongst others, political advocacy NGOs that promote BDS and lawfare campaigns, through direct and indirect funding mechanisms. The German government funds organizations that contribute to the growing demonization of Israel and BDS campaigns. Such funding is a major source in manipulating German societal perceptions of Israel and constitutes a misuse of taxpayer monies. Two organizations sent a brief to the Prosecutor of the ICC, alleging "war crimes committed by the British armed forces against detainees in Iraq from 2003 to 2008." German funding to political NGOs active in the Arab-Israeli conflict often supports radical organizations that oppose peace, promote demonization, political warfare, and in some cases, blatant antisemitism.